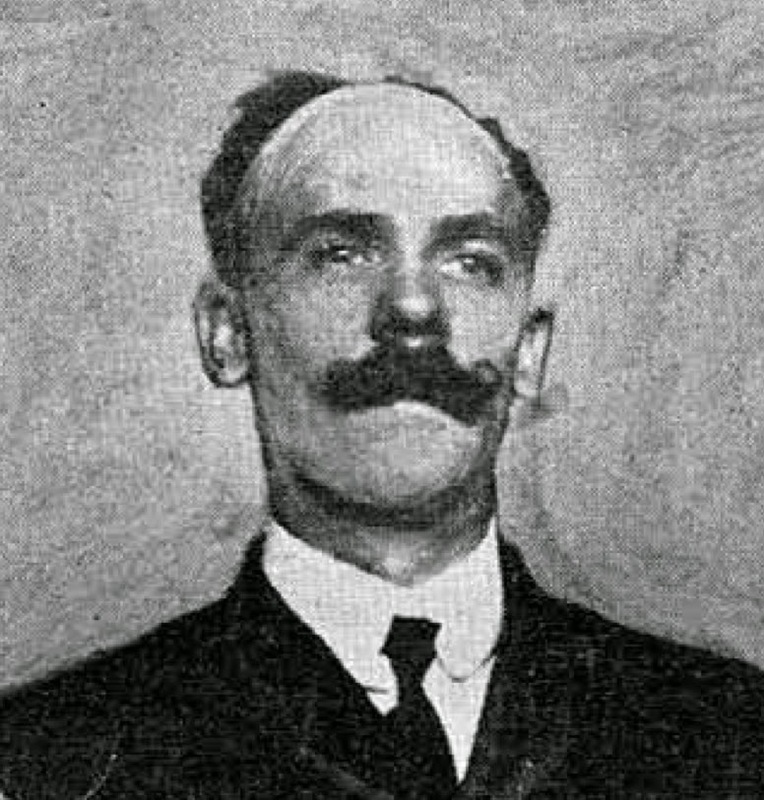 Emmett Henry Brotts was born in Seville, Ohio, in June 1865. His full name and birthplace was found on a family tree at Mundia. His birth date was recorded in the 1900 U.S. Federal Census. In the 1870 census, Brotts was the oldest of three children born to Henry, a druggist, and Helen. They resided in the township of Guilford in Ohio. The family lived in Westport, Missouri on Cross Main Street, according to the 1880 census. At some point, they moved to Kansas City, Missouri. The 1882 Hoye’s City Directory listed Brotts as a candy maker at Glesner, Ross & Company. The home address for Brotts, his brother, Ernest, a butcher, and father was 109 West 11th Street. The following year Brotts’ occupation was painter and residence at the same address. The Kansas City Times (Missouri), August 24, 1885, reported Brotts as a robbery victim. Mr. E.H. Brotts yesterday reported that while he was walking along Broadway near Eleventh st. Saturday night he was held up by highwaymen and robbed of a small sum of money. After robbing him the footpads ordered him to march, which he did with haste. When Brotts was robbed, he was an artist in a business partnership with H.W. Dickson. The city directory listing said Brotts lived at 1300 Broadway, his father’s residence. Brotts would remain there through, at least, 1888. Dickson & Brotts was located at 503 Delaware. The Kansas City Times, June 20, 1889, reported Brotts’ marriage. Mr. Emmet H. Brotts, the Journal artist, married Miss Daisy H. Chapman of Fort Scott yesterday morning at the home of the bride. The ceremony, which was a quiet one, was performed by the Rev. C.J. Coulter, a relative of Mr. Brotts, and but a few of the relatives and friends of the bride and groom were present at the nuptials. The pair left for the south immediately after the marriage to spend a week in travel. Emmet Brotts was born in Seville, O., in 1865. He came to this city in 1880, and for three years was engaged in the manufacture of candy. Giving up this trade, which was distasteful to him, he entered an architect’s office, and later formed a partnership with Mr. Dickson of this city to do general designing and engraving, which place he filled competently until his connection with the Journal. Kansas City directories for the years 1889 to 1891, said Brotts was a wood engraver at the Journal, and in partnership with H.A. Roberts in Brotts & Roberts, engravers at 900 Main Street. In 1893, Brotts was the proprietor of the Midland Engraving Company, 900 Main Street. His residence was 722 Forest. At some point, Brotts moved to Chicago. The 1897 Chicago city directory recorded Brotts at 1806 North Halsted as an artist with the Times-Herald. He remained with the Times-Herald, according to the 1899 and 1900 directories, and resided at 291 Ontario Street. Brotts’ address was unchanged in the 1900 census. He was a newspaper artist and divorced. His wife and son, Ervine, lived in Chicago with his mother-in-law, Mary Chapman. In 1901 the Times-Herald merged with the Chicago Record to form the Chicago Record-Herald. In 1902, Brotts produced Little Pic which was a Sunday strip that ran through 1903 in the Record-Herald. He also produced numerous illustrations for the paper’s Sunday children’s section into 1905. A staff photograph was published in the Second Annual Loan & Sale Exhibition of the Newspaper Artists of Chicago (1903). The Inland Printer, February 1903, reproduced some the New Year’s greeting art sent to Frank Holme in Phoenix, Arizona. Brotts contributed a drawing. Julius A. Lloyd’s book, Home Made Hash (1909), was illustrated by Brotts. Brotts had listings in the 1909, 1912 and 1916 Chicago Blue Book of Selected Names of Chicago and Suburban Towns. He has not been found in the 1910 census. In 1920, the census said Brotts, a “widower” and commercial artist, lived at 5 East Erie Street in Chicago. Also with him was his son, age 26 and a garage mechanic. The Chicago Central Business and Office Building Directory 1922 recorded Brotts in the Northern Office Building. 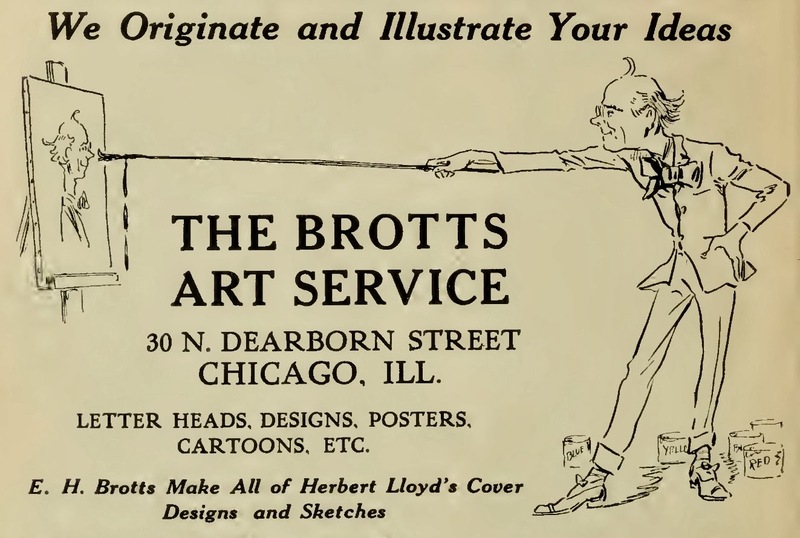 Brotts advertised in Herbert Lloyd’s book, Vaudeville Trails Thru the West (1919). In the 1930 census, Brotts lived with his niece and her daughter in Chicago at 3745 Herndon Street. His occupation was commercial artist. Brotts stayed with them but a a different address, 3745 Lakewood Avenue, according to the 1940 census. His highest level of education was the sixth grade. At age 74 he was no longer working. On January 6, 1943, Brotts’ ex-wife, Daisy, passed away in Los Angeles; she had been living with her son, Ervine, and his wife, Edith. Ervine died June 17, 1947. The Illinois Death Index at Ancestry.com said Brotts passed away July 19, 1947, in Chicago. An obituary has not been found.